Born and raised in Germany, Simin Koernig grew up in a beautifully artistic environment. Her family was her greatest influencers, letting her dabble in painting, drawing, Papier-mâché, clay/dough art and photography. 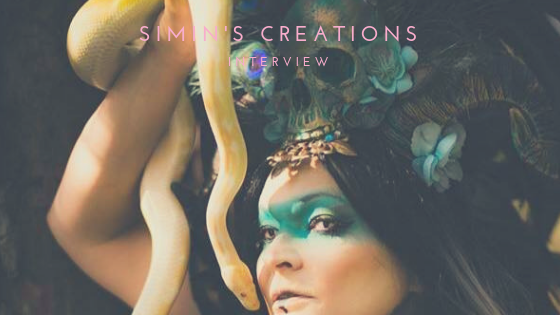 Without their support and introduction to those various mediums, Simin’s Creations might not exist today. She moved to Chicago in 1996 after travelling to the United States to improve her English. Just a few years later, in 2000, she was introduced to jewelry making by a friend and became fascinated by the way she manipulated jewelry wire and created something unique. It was then that she decided she would master the art of jewelry making. It’s only in recent years that she began to create unique pieces with feathers, skulls, horns and more. When she was invited to a Mad Max-themed Halloween party, she created five feathered Mohawks to complete the costumes of her and her friends. It was then that she moved her focus into creating one-of-a-kind headdresses. Other pieces can take anywhere from two and a half to three weeks from start to finish, as she hand carves individual pieces and twists wires in certain ways to create the exact look that she envisioned. “Not every piece I start working on turns into a finished product; sometimes I leave half worked pieces aside until that moment comes where the pieces calls me back and then it gets completed in a way that it feels perfectly right,” Koernig said. She also completed three years of special effect makeup school and specializes in Special FX Make-Up, Theatrical Make-Up, Face and Body Painting, Sculpting, Creature Design as well as FX Dentures. She even uses what she learned at Kosart Effects Studios and integrates those concepts into her headdresses and jewelry art. The biggest piece of advice that Simin Koernig ever received was, “Learn whatever interests you. If you fall in love with it, it will stick with you. If not, keep trying new and exciting things.” She lives and breathes by that piece of advice, hence her ever-evolving talents. With such unique talent, this is surely not the last time you’ll see these distinctively beautiful pieces of art.